This month - I did both! I started by making my background panel. I used a technique from Wendy Vecchi called Splattered Plaster Technique. 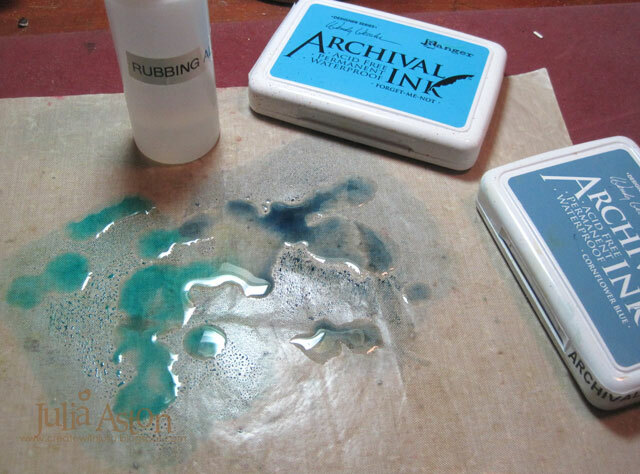 First, I rubbed two inks on my craft pad and poured a lot of Rubbing Alcohol on it. Then I dragged a piece of Ranger Specialty Stamping Paper (it's kind of glossy) through the mix and dried it with my heat tool. The Picket Fence stain doesn't really mix with the inks and you can see how it looks like little spots of plaster on the cardstock. 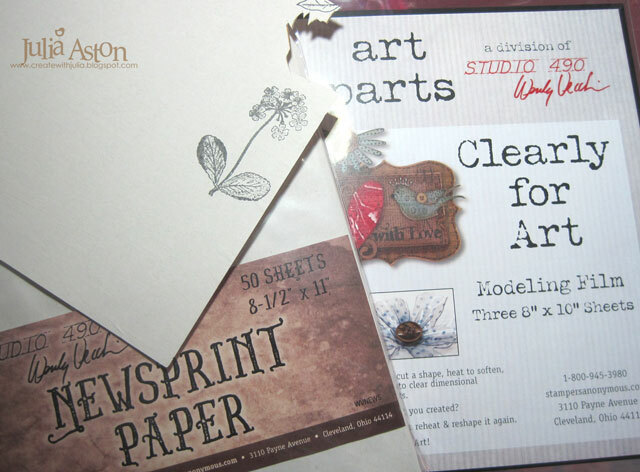 I made the flowers and leaves using Newsprint Paper and Clearly for Art Modeling film - another Wendy Vecchi technique. First I glued the newsprint to the modeling film using Glue N Seal. After it dried, I stamped the flower from Forever Art onto the newsprint side using Watering Can Ink. I colored the flower with Copics and cut it out close to the edge. The fun thing about the modeling film backing is that you can heat it with your heat tool and it softens so you can mold it a little for dimension. 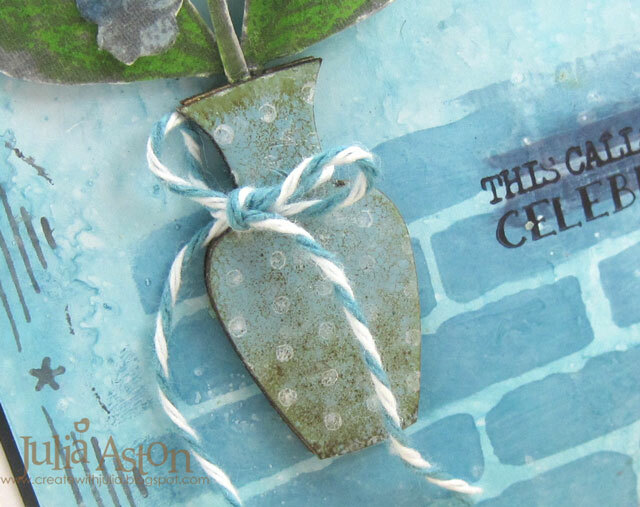 I made the vase using Wendy Vecchi's Mat Minis/Pitchers and Vases - embossing it with Sky Blue Embossing powder and then stamping it with a dots stamp using Adirondack Snow Cap Ink. I stenciled the background with a Vintage Quilt and Basically Bricks Stencils. 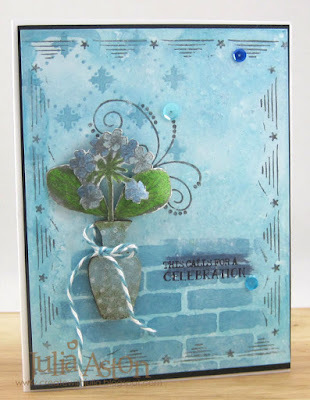 I stamped the border, flourish with Watering Can Ink and the sentiment with Jet Black ink. To finish off my card - I added 3 blue sequins and tied some twine around the neck of the vase. Sadly, today we are saying goodbye to some of our fellow Design Team members - we'll miss you Char, Deepti, Jan, Loll, and Lyndal! But on a happy note we are welcoming several new Design Team Members - Becca, Lee-Anne, Lysa, Melissa, Michaela, Tenia, and Yasmina. We are excited to be working with you ladies! Please welcome them when you visit their blogs! 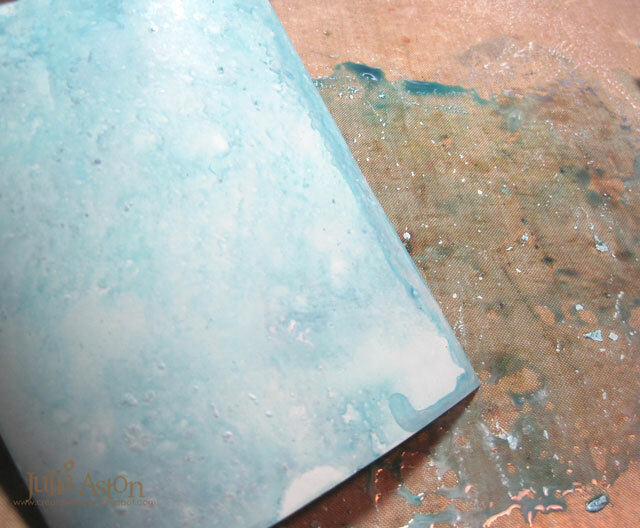 So how does blue inspire you in a mixed media way - using texture, dimension and techniques? We hope you will join us this month - check out all the inspiration and challenge instructions over at the Mixed Media Card Challenge blog. 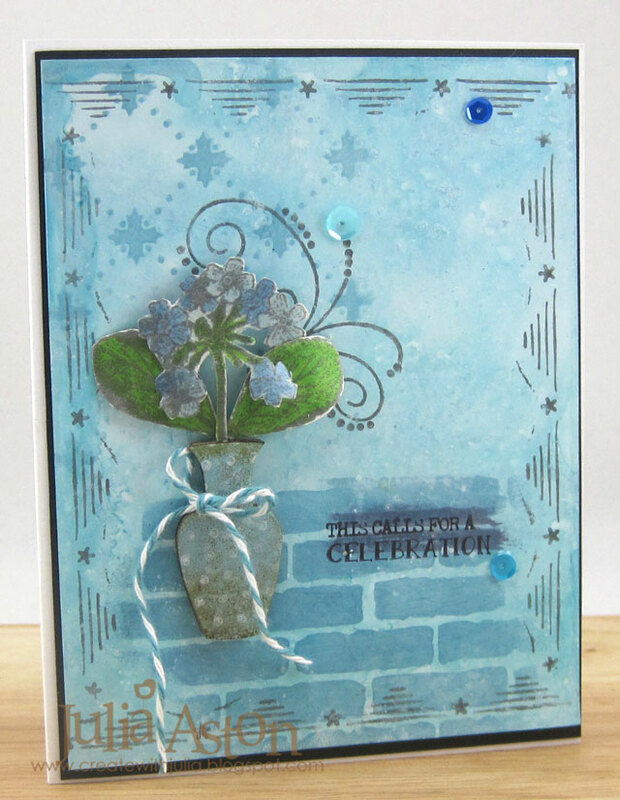 Stamps: All Occasion Art, Forever Art, Say It with Art, Large Collage Background - Wendy Vecchi Studio 490/Stampers Anonymous. 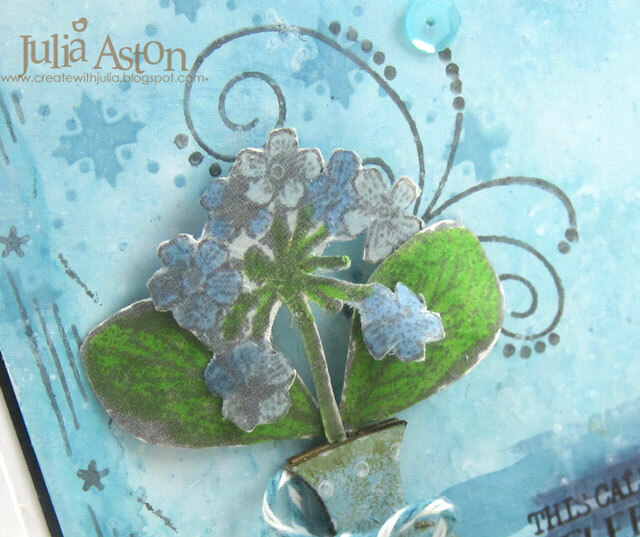 Ink: Wendy Vecchi Archival Cornflower, Forget Me Not and Watering Can, Archival Jet Black, Snow Cap Adirondack. Julia this is absolutely breathtaking!!! All the pretty stencils in the background and that wonderful little vase and all in my absolute favorite color!!! I am in heaven!!!! Thank You Julia!! Miss you too! Your card is spectacular!!!!!! I love the BG and that gorgeous vase! Oh that background is amazing! Stunning design, Julia! So happy to be on the team with you! Gorgeous, gorgeous background and very sweet vase of blooms! Oh I really love your background!!! i'm very happy to be with you on the team! I love the background! Thanks for including the link to the tutorial. I'm going to try this technique. The vase is really cool too. I'm happy to be on your team!! wow this is stunning.. awesome designing.. So pretty Julia! Love all the shades of blue and your beautiful vase full of flowers! This is a beautiful card with lovely colors. I love how you did the background, and must give that process a try. 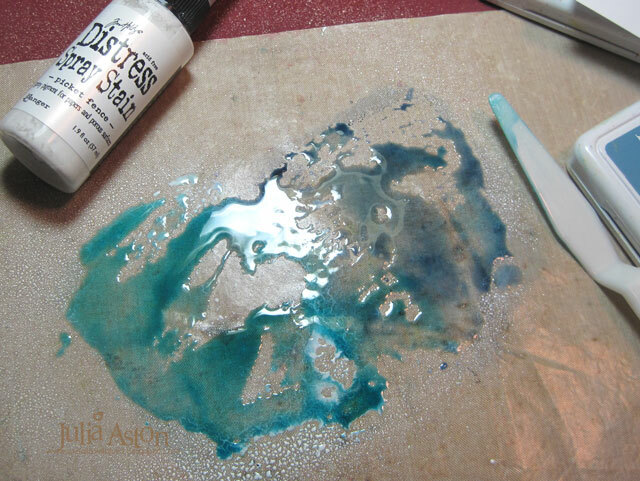 I love to use alcohol to give my flat acrylics some life, but never tried it this way! Very cool results! 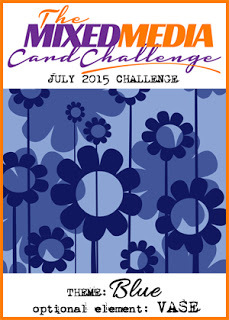 Thank you for choosing my card to highlight last month at MMCC! What a thrill and honor! Hugs! Thanks for sharing the technique to create this totally fabulous background. Beautiful card too. Fabulous card, Julia! Love the look of that Distress Stain background, will have to give it a try!